Feeling a bit fragile today... give me a couple of days and i'm sure i'll be back on form! In the meantime here's Marth munching on her dinner! (It doesn't last long, so you have to be fast to grab a picture!) 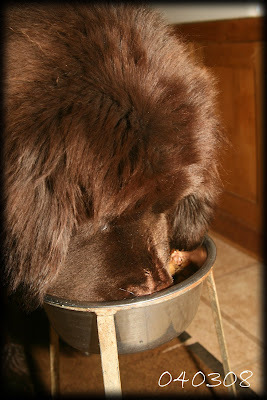 As you can see my girls eat from a raised stand, this has a number of uses, it means a big tall dog like a Newf doesn't have to stoop and can help prevent bloat (nasty, nasty condition that can kill dogs) - but almost as many people though will tell you not to feed on a stand for the same reason, but it's worked fine for my girls for the last 15 years so if it's not broke.... In any case most Newfs are too damn lazy to bend down to eat!